Reexamining electoral vote allocation is back in the news again. The story is the same as it was two years ago when red-blue states, that is to say, Republican-controlled state governments in states that have voted reliably Democratic at the presidential level, considered altering the way in which they were allocating electoral votes. FHQ touched on this two years ago, and I thought Jonathan Bernstein nicely updated his comments from the same period at Bloomberg View. It still strikes me as interesting that states would consider this. First of all, it creates on the state level the potential for there to be a popular loser: someone who could win fewer votes yet still win a majority of the electoral votes from a state. That argument at the national level is one of the most frequent criticisms of the electoral college system itself. Secondly, and perhaps more importantly, a districted plan -- where states allocate electoral votes by congressional district -- tends to dilute the power of the states. Had a districted plan been in place in Michigan in 2012 both of those issues would have been at play. Mitt Romney would have won a 9-7 majority of the Great Lakes state's 16 electoral votes despite Barack Obama winning more votes statewide. That would have, in turn, greatly reduced the power of Michigan in the electoral college. A two electoral vote margin that is largely baked into those districts would attract the candidates to the state a lot less than the promise of a 16 electoral vote cushion/win. To FHQ, the winner-take-all allocation of electoral votes is a lot like the filibuster: You don't want to give up on it now because you might need it/benefit from it in the future. But the new proposal in Michigan -- HB 5974, sponsored by Representative Pete Lund (R-36th, Macomb) -- is not the districted plan as it was two years ago. It is different in that it has built-in incentives addressing the above criticisms of that plan. Regardless of whether the new legislation passes in the current lame duck session of the Michigan legislature, it is an interesting tweak to some of the plans that have been deemed electoral college "rigging". This plan has some interesting implications that are worth exploring. ...or if not worth exploring, then fun to look at. 2) The top finisher in the statewide count receives an additional electoral vote for each increment of 1.5% the statewide winner gets above 50%. There is a nice breakdown of this over at the Bridge. Basically, if the winning candidate receives 61.5% of the statewide vote, that candidate receives all 16 electoral votes. The first point always avoids the popular loser complaint, unlike the districted plan. The statewide winner would receive a majority of the electoral votes, but only narrowly if the vote is close. In other words, the electoral vote allocation is more proportional than districted. The incentives the candidates and their campaigns face in dealing with this particular plan is distinct from the districted plan as well. The redistricting process, as hinted at above, bakes in the results of the electoral vote in a way that would dissuade candidates from coming to the state to fight for electoral votes. 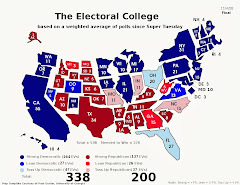 Campaigns would only expend resources to get an electoral vote or two if a near-tie in the electoral college was a near-certainty. The newly proposed plan in Michigan circumvents that issue to some degree. Candidates would be motivated under a plan that awards "bonus" electoral votes to either try and run up the score (statewide vote percentage) in Michigan, or barring that, try to at least maintain resource expenditure parity with the other candidate. FHQ does not want to overstate this effect though. If anything, the added electoral vote for each 1.5% increment of the statewide vote over 50% adds another strategic element to the puzzle. But even if Michigan was off the board and not as competitive heading down the stretch, then that does give incentive to the favored candidate to spend some time/money there in an effort to get as close to a winner-take-all allocation as possible (if the overall national electoral college vote distribution is somewhat close). Think about a state like North Carolina in 2008. The Obama campaign put resources into the state late and the McCain campaign was unable to match it. Those 15 electoral votes were superfluous to what Obama needed to get over the 270 electoral vote barrier. 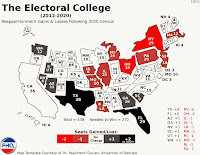 1) It probably goes without saying that if this newly proposed plan had been instituted in Michigan in the past, it would not have changed the overall outcome of the electoral college. The closest instances would have been in 2000 and 2004. In both cases, George W. Bush would have gained a handful of electoral votes to add to an already winning total. And to repeat, this plan eliminates the potential for popular losers within the state of Michigan. That also obviously didn't happen in any of these elections. 2) There are just three cases where the winning candidate cleared the 55% threshold and was able to take advantage of the bonuses in any meaningful way. That is a quarter of these 12 total elections. In the other 75% of the cases, Michigan's electoral vote power would have been reduced to something between Iowa (6 electoral votes now) and something less than Delaware/Wyoming. That really offers no guaranteed pull to candidates despite the claims of those sponsoring the legislation in Michigan. 3) Even semi-successful third party candidates really mess this up for the top vote-getter. That increases the likelihood that no candidate clears the 50% barrier and thus a near-even distribution of the electoral votes. [The 1.5% bonus is never triggered.] Humphrey won Michigan by 7.5%, gets within a stone's throw of 50% and splits the electoral votes 11-10 with Nixon (see also 1980). 1996 offers another interesting tale. Clinton barely clears 50%, gets one bonus electoral vote, but splits the total 11-7 with Dole, who received less than 40% of the vote. Aside from eliminating the potential for a popular loser outcome -- relative to the districted plan -- this new electoral vote allocation proposal does not clearly do what its proponents argue it would: make Michigan relevant during the general election. That does not seem to be the case here. It would only have reduced Michigan's electoral vote power. What it does do is provide us with a fun counterfactual exercise with some interesting outcomes. And that's about it. It has been over a week since Manu Raju reported that Senator Rand Paul (R-KY) has had preliminary discussions with the Republican Party of Kentucky (RPK) about the possibility of the state party switching from a primary to caucuses as a means of allocating delegates to the 2016 Republican National Convention. Such a move would help a now-latent Paul presidential campaign circumvent state law barring him from appearing twice on the May 2016 Bluegrass state primary ballot (once for renomination to run for his US Senate seat and also for the presidential preference vote). Democrats retain control of the Kentucky State House in the 2014 midterms. The majority Democrats also signal that they would block attempts to change the law, allowing Senator Paul to run simultaneously for both a senate and presidential nomination. Paul and Kentucky Republicans consider a shift to caucuses to accommodate the senator and to avoid Paul breaking the law. Outside of that outline, though, some of the commentary on this has been a bit off. First of all, this is something of a no-brainer reaction from Kentucky Republicans and Senator Paul. The barrier separating a law change -- a Democratic majority in the Kentucky State House -- survived the midterm elections. It is not as if states and state parties have not done things to benefit their favorite son presidential candidates during the nomination phase of the campaign in the past. Typically, that has resulted in calendar maneuvering at the state legislative level. In 2011, Utah Republicans considered moving the primary in the Beehive state to an earlier date to help Mitt Romney. In 2005, Governor Mike Huckabee signed into law a bill moving the Arkansas presidential primary from May to February for a 2008 cycle that saw Huckabee run for run for the Republican nomination. Similarly, Illinois legislators pushed through a bill in 2007 moving the Prairie state primary up a month to February to boost Senator Barack Obama's chances in the Democratic nomination race. In 1988, the entire South (a group that included Kentucky) shifted their nominating contests up in the hopes of building momentum behind a southern Democratic nominee (who could win the White House).1 There are plenty of other examples, but this type of supposed machinations from the states is not new or all that controversial. It also is not the sort of move that would potentially draw legal challenge from Kentucky Democrats (as Raju mentioned in passing in his Politico piece). FHQ is still trying to figure that one out. Challenge what? The shift to caucuses? Paul's name being on a caucuses ballot (president) and a primary ballot (senate)? The former is not something that would last long in the courts. State parties have the freedom of association rights to select the mode of delegate allocation (primary or caucus) and who can participate (open, closed or some hybrid primary type). More often than not the courts side with the parties. Idaho Republicans, for instance, abandon the traditionally late presidential primary in the Gem state for early March caucuses for the 2012 cycle. Nebraska Democrats took a similar path four years earlier. Kentucky Democrats could challenge Paul appearing on two ballots, but would find that a likely uphill climb because 1) there is not typically a ballot at caucus sites and 2) the language of the Kentucky law is a bit quirky naming only voting machines and absentee ballots (Again, neither of those would be involved in caucus proceedings.). Counter to what Jazz Shaw had to say at HotAir about the potential move in Kentucky, Kentucky Republicans would not have to reinvent the wheel in shifting from its business-as-usual primary to caucuses as a means of allocating delegates. Kentucky Republicans have used the primary as means of allocating delegate slots to presidential candidates. Yet, they -- the RPK -- also have had a caucuses system in place for the purposes of selecting delegates to fill those allocated slots. Rule 5.03 of the Rules of the Republican Party of Kentucky lay out the rules regarding the timing of those first determining events (precinct caucuses). They are to occur between March 1 and March 31 of a presidential election year. The only thing Kentucky Republicans would be likely to do is to clean up some of the language to have the precinct caucuses all coinciding on the same date, say, March 1. Making the switch would not be difficult for the party, but participation would certainly go down relative to a primary. One final thing FHQ has not seen mentioned in association with this story is the fact that there have been concerted efforts on the part of (Ron) Paul supporters across the country over the last few years to take over control of state parties and/or to change the nomination processes in those states to caucuses. The elder Paul did quite well in 2012 caucuses/conventions. Hypothetically, such a move would potentially help Rand Paul too, though one would imagine him likely being quite successful no matter what type of contest his home state decided to adopt. This one will be an interesting one to watch develop from an institutional standpoint. The question is, does the RPK opt to shift and move to an earlier date where there may be other regional partners on the same date or try for an earlier calendar position where they may not get lost in the shuffle because of contest crowding and other candidates avoiding a likely Paul win for other states on the same date? The benefits are not as clear on that front as they are for Senator Paul avoiding breaking current Kentucky state law. 1 Kentucky Democrats had actually moved up in 1984, abandoning the May primary for set of March caucuses. In 1988, the state government moved the primary up to an earlier March date (only to move it back for 1992). "Secretary of State Brian Kemp’s efforts to build what he calls an “SEC” presidential primary in 2016 appear to be proceeding apace. "Kemp is working with his counterparts in Mississippi, Louisiana, Tennessee, Arkansas and Alabama to arrange a coordinated, regional primary for the first Tuesday in March 2016. 'It is my hope that our region will participate together that day and that the voters of the Southeast will have a major impact in the selection of the presidential nominees of both parties.'" 1) Kemp seems focused on that March 1 date for the Georgia presidential primary in 2016. The secretary has signaled more than once now that this is a likely destination for the primary in the Peach state. That is a change from the 2012 cycle when the date of the Georgia primary was an unknown through much of 2011 after the state legislature ceded the date-setting authority to the secretary of state. 2) Mississippi, Louisiana, Tennessee, Arkansas and Alabama are the low hanging fruit of potential presidential primary moves for 2016. Here's the calendar. Tennessee is already on March 1 (as Galloway and Bluestein mention) and Louisiana is now locked into a Saturday, March 5 primary date after legislation moving the primary up by two weeks was signed into law this summer. That will be as far as Louisiana moves up; the same week as the other southern states. Alabama and Mississippi are already slated for primary dates just a week later on March 8. Those states bumping their dates up by a week is not all that heavy a lift. Arkansas is a different matter. Having gotten lost in the early state shuffle during the Southern Super Tuesday in 1988 and the Titanic Tuesday of 2008, state legislators moved the presidential primary back to the traditional May date in the immediately subsequent cycles. However, Republicans now have unified control of the state government in the Natural state after the 2014 midterms and may be more receptive to such a move. 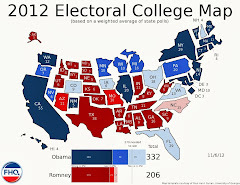 Over the weekend, FHQ could not resist the urge to pull the available polling data on the 36 senate races of 2014 and run them through the graduated weighted polling averages we use during presidential general elections to forecast the electoral college. No, there is no shortage of these predictions, but as is FHQ's wont, we like to see how well a simpler method of aggregation and analysis stacks up against the other models. Surprisingly or not, there is some convergence between these models on election day 2014. 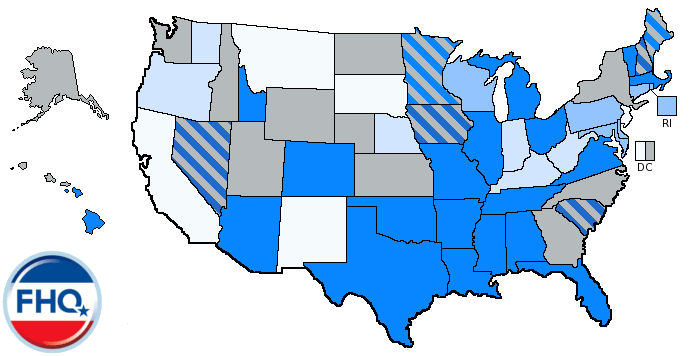 1) There is a band of around 10 states with competitive senate races (seen in lighter shades of blue and red on the map below). 2) Some are more competitive than others. Kentucky, for instance, is less competitive than, say, Colorado or North Carolina. 3) Most of the competitive states -- 7 out of 10 -- favor the Republicans. 4) There is a rough order to the states as far as their average margins are concerned (overall and the more competitive states in gray in the figure of final average margins below). With all the polling data in, that indicates that Colorado, Iowa, Alaska, Kansas and North Carolina are the states to watch this evening as the returns come in. There are still 8 states with races within 3%. 5) Republicans look poised to pick up seats in Montana, West Virginia and South Dakota with Kentucky looking likely to join that group. 6) If Republicans win the 15 states in which they are ahead in the averages by more than 10% then they will be sitting at 45 seats. Add Kentucky and that number increases to 46. 7) Even when the possible implications of runoff elections in Louisiana and Georgia are factored in, Republican candidates are ahead in Arkansas and more narrowly in Colorado, Iowa and Alaska. Those four, if they follow the FHQ projections, would put the Republicans at 50 seats. 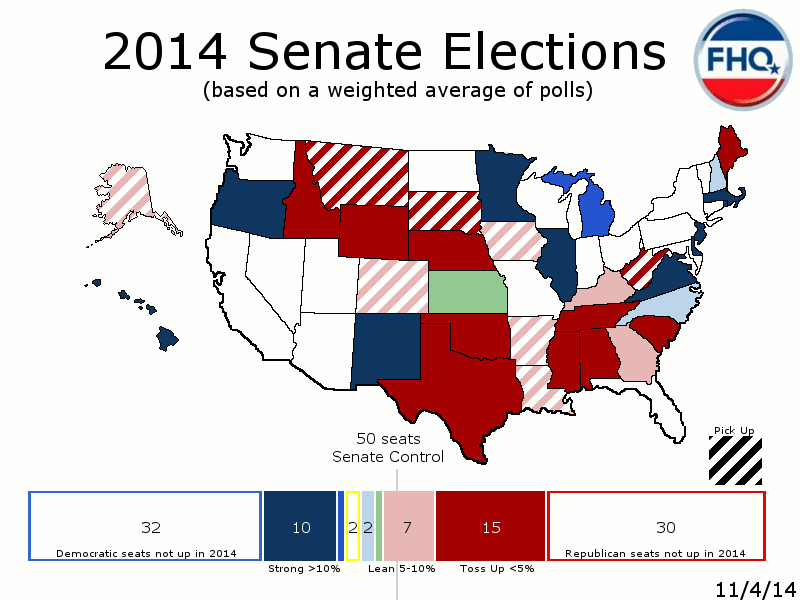 8) A Republican Senate majority would then depend on either Roberts/Orman race in Kansas and/or the two runoff states. 9) That does not take into account the possibility of Republican candidates running ahead of their averages in other competitive states, North Carolina and New Hampshire. In both, polls will close early and give a quick indication of whether the Republican tide has pushed to include the more competitive but persistently blue states (given the polling) this cycle. 10) There is more uncertainty about the path Republicans could take to the Senate majority than whether they will take that majority. FHQ projects Republicans will pick up 8 seats (Montana, West Virginia, South Dakota, Louisiana, Arkansas, Colorado, Iowa and Alaska) while losing Kansas. FHQ also projects Democrats to hold New Hampshire and North Carolina. If there are runoff elections in Louisiana and Georgia, Republicans would be sitting on 50 seats needing one those runoff states to claim the majority. 11) FHQ projects 52 seats for the Republicans and 45 seats for the Democrats with three independents when it is all said and done and the new congress is fully sworn in next January. Arizona Should Replace Iowa at the Front of the Presidential Primary Queue?